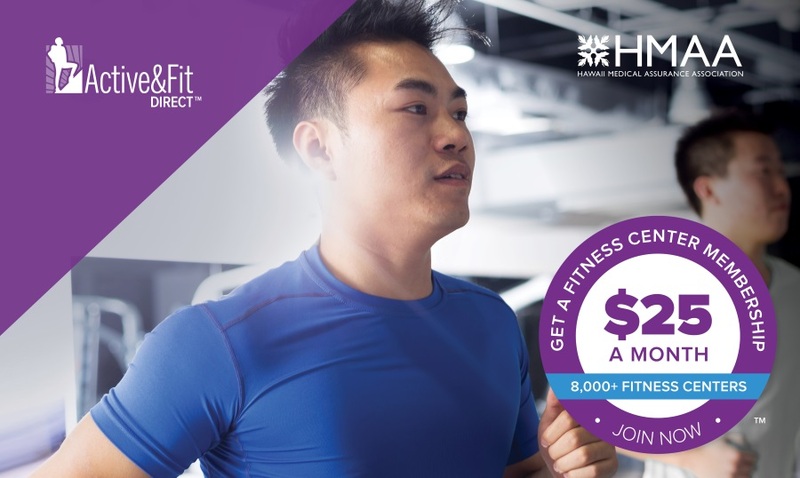 We’re making it easier for HMAA members to access a unique fitness membership experience through the Active&Fit® Programs by providing options for direct individual memberships as well as employer-sponsored benefits. HMAA offers the Active&Fit® Program to groups as an optional medical plan rider. By purchasing this benefit, employers provide their eligible members with access to 9,000+ participating fitness centers* nationwide such as 24 Hour Fitness and YMCA at a low annual cost of $100, or the option to work out at home using up to two Home Fitness Kits per benefit year at an annual cost of $10. The additional monthly premium is paid by the group for all medical plan members, with the annual fee paid by each member who elects to enroll. Enrollees enjoy quarterly online newsletters, fitness tools through the Active&Fit® website, and the Active&Fit Connected!TM tool**. The minimum age requirement is 18, and the plan administrator decides whether to offer the benefit to covered employees only, or extend coverage to dependents aged 18 and older. Certain exclusions and requirements apply. If you are a health plan administrator and would like to enroll your group or learn more, please contact your HMAA Account Manager. If you are an eligible member and ready to enroll in the program, view our step-by-step Active&Fit® User Guide. Note that the Active&Fit® Program offers a more economic choice for members than Active&Fit Direct™. Members pay $100 per year for the employer-sponsored program vs. $300 per year (plus a $25 initiation fee and taxes) for Active&Fit Direct. If you are currently enrolled in Active&Fit Direct and now have the option to enroll in the Active&Fit® employer-sponsored program (please check with your health plan administrator), you may cancel your Active&Fit Direct membership by logging in to the Active&Fit Direct website or contacting Active&Fit Direct Customer Service at 1.844.646.2746 (TTY/TDD: 711), Monday through Friday, 5 am to 6 pm PST. *Non-standard services at the fitness center which require an added fee are not part of the Active&Fit® program. **Purchase of a wearable fitness device or app is not included in the Active&Fit® program and will not be reimbursed. This program allows individuals to choose from 9,000+ participating fitness centers* nationwide for $25 per month (plus a $25 enrollment fee and applicable taxes), without requiring employer sponsorship. You can easily cancel your enrollment at any time after three consecutive months of enrollment. The minimum age requirement is 18. Online directory, maps and locator for participating fitness centers (available on any device). A free guest pass to try out a fitness center before enrolling (where available). The option to switch fitness centers to make sure you find the right fit. Online fitness tracking through a wide variety of wearable fitness devices, apps, and exercise equipment. Already have a fitness center membership? Certain participating fitness centers allow you to suspend your membership so you may join the Active&Fit Direct Program at no penalty. If in the future you decide to cancel, your original fitness center membership may be reinstated if it was suspended (not canceled). Please check with your fitness center prior to enrolling in Active&Fit Direct. Enroll or learn more about the Active&Fit Direct program. *Non-standard services at the fitness center which require an added fee are not part of the Active&Fit Direct program. The YMCA in Hilo is the only YMCA location in Hawaii participating with Active&Fit Direct at this time. 24 Hour Fitness does not participate in the Active&Fit Direct program. **Purchase of a wearable fitness device or app is not included in the Active&Fit Direct program and will not be reimbursed. The Active&Fit and Active&Fit Direct programs are provided by American Specialty Health Fitness, Inc., a subsidiary of American Specialty Health Incorporated (ASH). Active&Fit Direct, Active&Fit Connected!, Active&Fit, and the Active&Fit Direct logos are trademarks of ASH and used with permission herein.